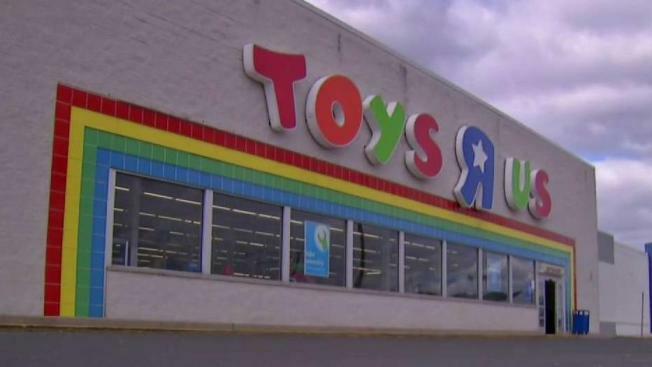 Shoppers who arrived at Toy R Us stores across the country for the toy chains liquidation sales were met with signs announcing that it had been postponed "due to circumstances beyond our control." The liquidation sale was expected to begin Thursday after the company announced last week that it was shuttering its U.S. operations, jeopardizing the jobs of some 30,000 employees and bringing to end a 70-year run for a chain known to generations of children and parents for its sprawling stores and Geoffrey the giraffe mascot. Customers looking for a bargain at one of the chain's remaining 740 U.S. stores will now have to wait a little longer to shop the liquidation sales. Amanda Cacialli arrived at the Toys R Us store in Johnston City, New York, at 9:30 a.m. ET Thursday hoping to score some merchandise at discount prices. She was instead met with a sign that said "Liquidation Sales Will NOT Start Today as Originally Scheduled." A sign at a Toys R Us in Ocala, Florida, announcing the liquidation sales that were previously scheduled to begin Thursday had been postponed. "I'm very upset," she told NBC. "There are lots of people here upset." Similar signs were posted at Toys R Us stores around the country, according to social media posts. One Twitter user told NBC employees at a Toys R Us store in Ocala, Florida, said they didn't know when the sales would start. A person familiar with the matter said the liquidation sales were were delayed due to unforeseen circumstances and were likely to start on Friday. The person did not say what those circumstances are. An email request for comment from Toys R Us was not immediately answered. The New Jersey-based retailer, which filed for Chapter 11 bankruptcy protection in September 2017, announced earlier this year that it planned to close 182 stores, citing increased competition and a shift in customers moving away from traditional brick-and-mortar stores to shopping online for the decision. But after Toys R Us was unable to successfully reorganize, it decided it had to liquidate and announced last week that it would begin going-out-of-business sales Thursday and hope to complete those by the end of June 2018. Meanwhile, The Associated Press reported that toy company executive Isaac Larian says he and other investors have pledged $200 million in financing and hope to raise more in crowdfunding in a bid to save potentially more than half of the 735 Toys R Us stores that will go dark in bankruptcy proceedings.